Just watched 'Out With Dad' this morning, probably my favourite ever episode. I loved Martin trying to "gay it up a little". "Emily, have I told you I love your hair. It's divine!" So many quality lines. "It's over, you hear me? Over! And I'm keeping the jewelry!" Yesterday, when Frasier had a fever. This showed the writer's creativeness, and Frasier was hilarious as usual. He gets taken away in a swivel chair, fascinated by it, and then tries to rush back in but then gets taken away again. 'Daphne! Daphne! I had a dream!' Daphne reassures him it was a dream, but keeps the fact it was real hidden until he is all better. Just watched The Matchmaker last night. It was hilarious and just reminded me again what a brilliant mind Joe Keenan has. "Wait so the Maris guy he kept mentioning.. Is a woman?" "Well the jury's still out on that one!" Extremely simple plot yet all the gay cliches were so tastefully and believably executed in a way that only Frasier can be. I had to look up The Matchmaker and Joe Keenan. I do remember that episode very clearly. Brilliant and so so funny. One of those episodes that was responsible for establishing the very high polish that the show became famous for. I've always really liked Tom and I think it's too bad he was only the station manager in two episodes. And just because I finished watching the whole show yesterday for the first time. Best sit-com EVER! 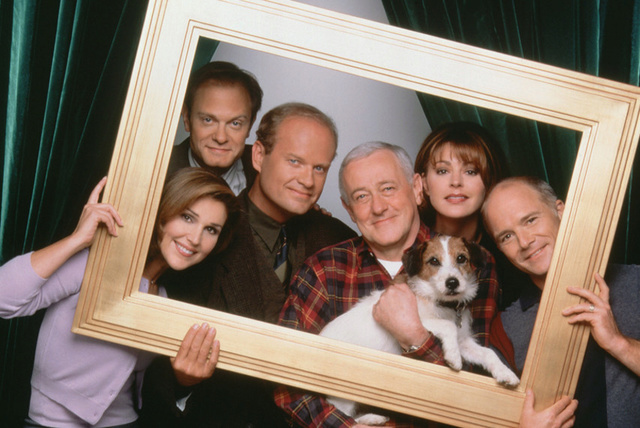 It's always sad reaching the end of a show, but with Frasier, the episodes are still great stand-alone so easy to watch out of order. I'm sure you'll still be watching them over and over again! The Show Must Go Off. Watched it last night on the Hallmark Channel. Derek Jacobi is simply hilarious in the episode. My favorite episode of Season 8.